With thier African and Portuguese roots, the people of Cape Verde have a vibrant cultural mix. They have a passion for music, poetry and song that is really important in their everyday life. 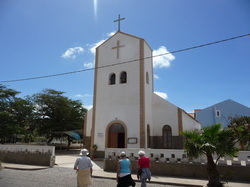 Most Cape Verdeans are Catholic. Portuguese is the official language of Cape Verde, but the everyday language of the people is Kriolu (creole), a facinating mix of African and Portuguese. Basic English is understood in restaurants, taxis, and other tourist establishments. Fish, fresh from the sea, appears in all Cape Verde's restaurants. The country's colonial history has resulted in a cuisine that is a mix of Portuguese, European and African influences. Fish lovers will be in their element in Cape Verde. Tuna is landed daily, along with Swordfish, Wahoo, Grouper, Sea Bream, Octopus and a host of other local varieties caught from small boats using traditional methods. The Lobster and prawn in particular, are exceptional,and juicy steaks come over from Brazil and South Africa. The island of Sal is the most cosmopolitan in Cape Verde, and the town of Santa Maria with its cobbled streets lined with surf shops, market stalls and restaurants is the main tourist area. The white sandy beach is the big star. It stretches for eight kilometres, with beach bars and dunes all part of the deal. Sal is considered to be amongst the world's top 5 windsurfing locations so it is not uncommon to see bright coloured sails dotted about the turquoise ocean. Kite surfing, is also big on Sal and is to be an Olympic event for the first time in 2016. Diving and deep sea fishing are also big on Sal. There are plenty of places to hire equipment, have lessons and organise trips. If you can, do not miss the opportunity to take a trip on a quad bike leaving from Santa Maria. An ideal means of transport for discovering the spectacular landscapes and deserted beaches on the island. Sal is also a nesting site for sea turtles. Many of the beaches are protected during the nesting season. You can take night time trips to find nesting turtles in the summer, and divers can swim with them. Sal means salt, and the island was named after what was once a very precious commodity. Salt is still collected from the inside of an extinct volcano on the island.